Did you know Ecuador’s constitution recognizes the “Rights of Nature?” The country takes protecting and respecting nature, including the Galápagos Islands, very seriously. And Monograms takes your Galápagos Islands vacation seriously, because we know an amazing experience is waiting for you! That’s why on this 7-day vacation package, we’ve arranged your hotel and cruise accommodations (including porterage), most of your meals, private airport transfers to/from your intra-vacation flights, and sightseeing. Plus, a one-of-a-kind feature is the Monograms Local Host® in Quito, a local expert who is your friend in the city and available to answer questions, offer suggestions, and help ensure your vacation runs smoothly. Your vacation begins as soon as you arrive in Quito. We can pick you up at the airport and transfer you seamlessly to your selected hotel. To help you get settled, your Local Host will answer questions you may already have and give you a set of materials to acquaint you with the city. The next morning, after your included breakfast, we’ll pick you up at your hotel for a private sightseeing tour of Quito. With a local expert—someone who knows the city’s inside secrets and fascinating stories—visit the must-see sights, such as Independence Square and the San Francisco Plaza Church. You’ll also have time in Quito to explore on your own. Perhaps you will choose to visit the Middle of the World, where you can stand with one foot in each hemisphere and cross the equator! 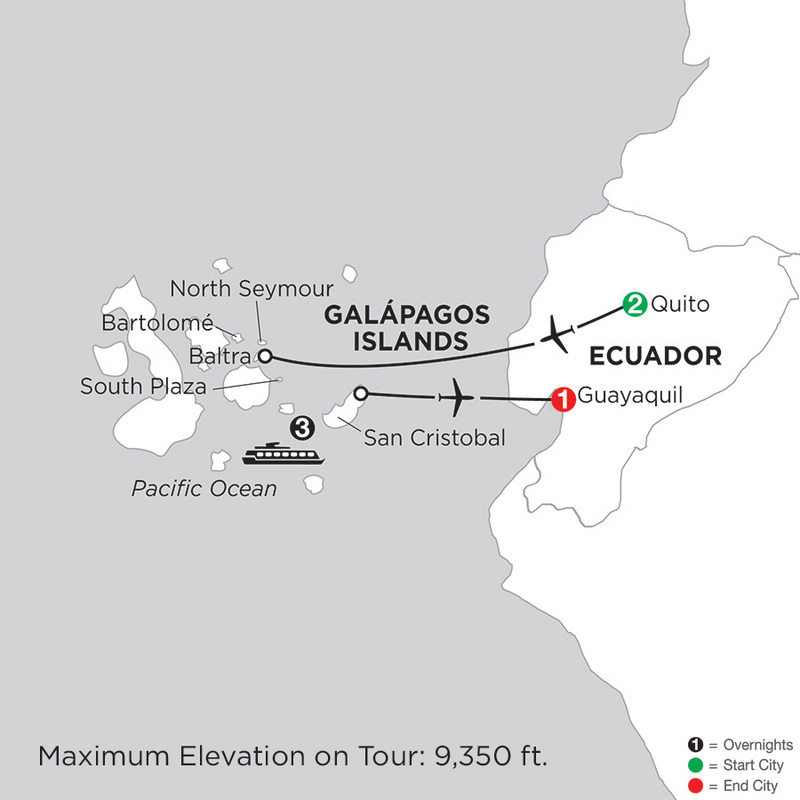 Next: fly to Baltra to embark your 3-night cruise to the Galápagos Islands, including Bartolomé, South Plaza, North Seymour, and San Cristobal Islands. On board the Galápagos Legend, all of your meals are included, and you’ll be accompanied by a Naturalist, an expert who will point out the flora and fauna, share his/her knowledge, and answer questions you may have. With its abundant sea life and clear waters, Bartolomé Island offers you some of the best snorkeling in the archipelago. Additionally, you’ll hike to its summit to witness spectacular views of the surrounding islands. At South Plaza, see the hybrid iguana as well as Nazca and blue-footed boobies along with other tropicbirds. Next, on North Seymour Island you’ll observe blue-footed boobies, magnificent and great frigatebirds, sea lions, land iguanas, and swallow-tailed gulls. And on San Cristobal Island, you have the chance to see all three booby species: Blue, Red and Nazca boobies! 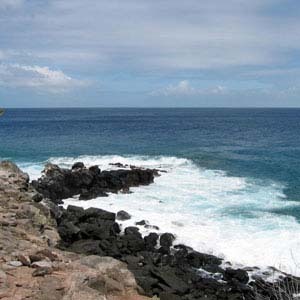 This is also a great island to enjoy the amazing snorkeling to admire the colorful marine world. Your final stop is at the Giant Tortoise Reserve to learn about the tortoise population in the archipelago and what is being done to protect these endangered species. Your vacation ends in Guayaquil, where you’ll have time to explore the city on your own. And did we mention we’ve included private transportation between the Guayaquil airport and your hotel? Add the sightseeing and guides we’ve arranged, the accommodations we’ve booked, and the meals we’ve included, and you are all set for an amazing vacation experience!